illegal Peruvian timber hatched in Mexico? A controversial intervention by Mexican and Peruvian diplomats behind the back of the justice system, that released a huge consignment of timber illegally extracted from the heart of the Amazon. The is the epilogue to an adventure that involves powerful businessmen and demonstrates the failure of the transnational control system for the million dollar trade in forest species. In the port of Tampico, in the troubled northern Mexican state of Tamaulipas, the final touches were made to an audacious international strategy that lead to the clearance of a million dollar shipment of timber of illegal origin that had been impounded through “Operation Amazon”, the largest seizure of its kind in Latin America. It consisted of timber from the Peruvian jungle, an amount equivalent to the freight capacity of 60 semi-trailers. The irregular maneuver enabled to the cargo—subject to a confiscation order issued by Peruvian prosecutors—to be delivered to a group of powerful Mexican businessmen. This investigation by Ojo-Público.com of Peru, W Radio , and the Latin American CONNECTAS journalism platform confirms that the shipment was cleared through the intervention of Mexican and Peruvian diplomats behind the back of the justice system in Peru. 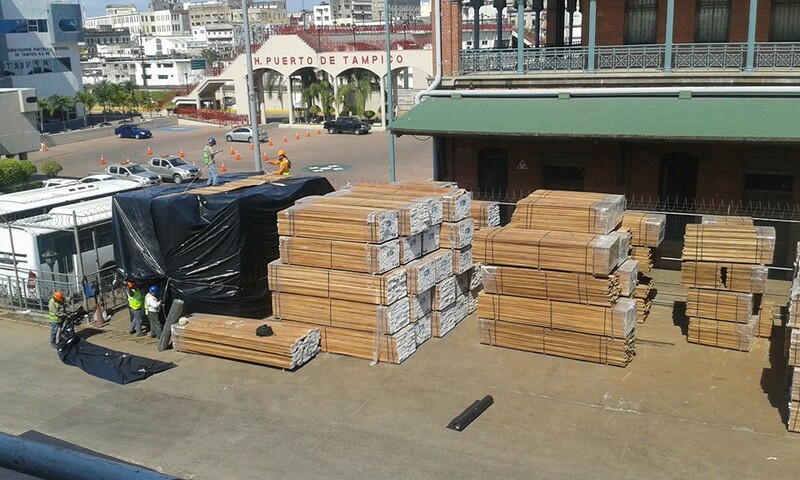 Much of the wood that arrived at Tampico had been exported by a Peruvian company—Inversiones La Oroza. A week earlier, its imports to the United States had been banned by Office of the United State Trade Representative because it had traded timber of illegal origin through the port of Houston. The consignment that reached Tampico was shipped on the Yacu Kallpa, whose voyage from Iquitos—the most important river port in the Peruvian jungle—was long and hazardous. 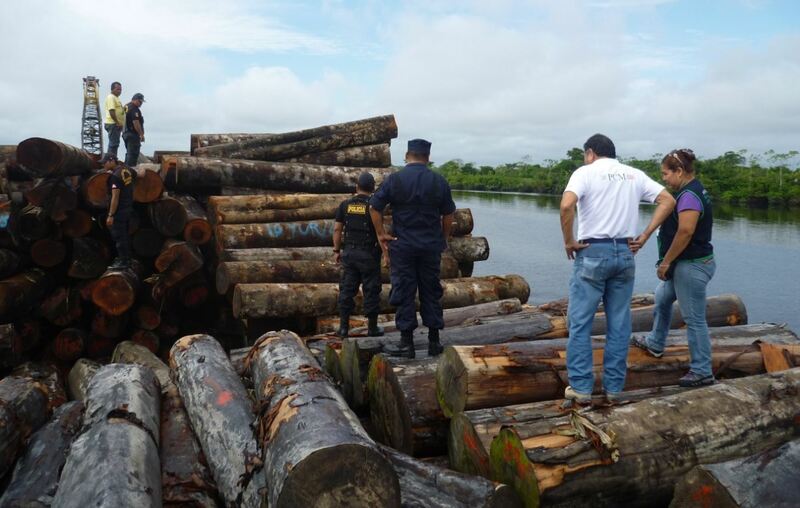 Some 96% of the logs were under a confiscation order issued by Peruvian prosecutors. This was backed by a technical report from Peru’s Agency for Supervision of Forest Resources and Wildlife (OSINFOR), which confirmed that the timber came from forests in which logging had not been authorized. Following the irregular release of the timber, the Peruvian judicial system requested information from the Mexican Attorney General to identify those responsible. Two of Mexico’s most important timber companies benefited from the release: CG Grupo Forestal S.A de C.V and CG Universal Wood S.A de C.V. Both companies face legal action in Houston because they have been unable to prove that the timber sent to their subsidiaries in the United States is of legal origin. The applicable statute is the Lacey Law, that prohibits the importation of products without the necessary certificates of origin. This represents a measure to counter illegal deforestation. It stands in contrast to the events in Mexico, which only demonstrate the weaknesses of controls in Latin America. Puerto de Tampico, located on the northern border of Mexico. Here the wood that traveled in the Yacu Kallpa in 2016. The Yacu Kallpa began its odyessy in Iquitos on 24 November 2015. On that day the public prosecutor for environmental offenses ordered seizure of the shipment bound for Mexico and the United States. Without the logistical means to unload the timber, the prosecutor had no alternative but to authorize the boat to sail, placing it with an order that the cargo could not be moved or traded. 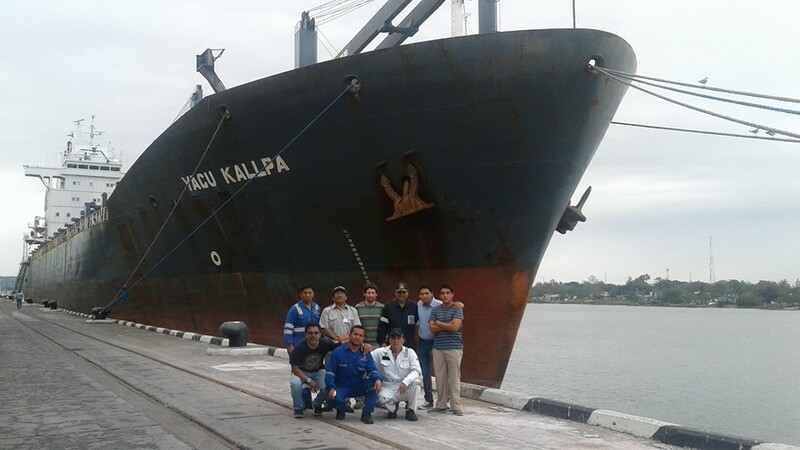 One month later, the Yacu Kallpa arrived in Tampico following a voyage that included a docking in the Dominican Republic and mysterious approaches to the coasts of Suriname, Honduras, and Jamaica. Upon its arrival in Mexico, the Yacu Kallpa made headlines in local newspapers, and not just because of the illegal origin of the wood: the ship’s owners abandoned both the vessel and the crew. Although the protests of the seamen were vocal, the media interest soon died down and the owners of the timber in Mexico began proceedings to secure its clearance. They argued that they had purchased the timber from their partners in Peru in good faith and that according to the documentation, everything was in order. 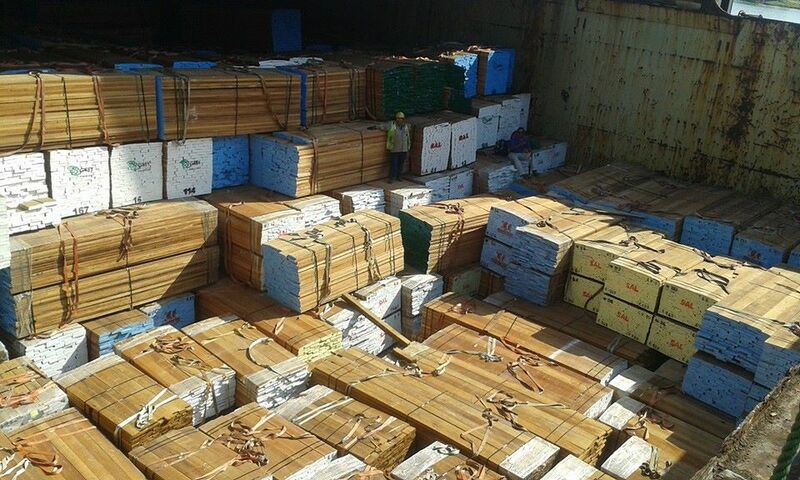 Tampico port administrators and the National Timber Chamber of Industry claim that the person responsible for rescueing the seized shipment of timber was the President of the Mexico-Peru Chamber of Commence Eduardo Guiulfo, a Peruvian businessman based in Mexico. According to documents obtained for this investigation, business interests exerted influence at all levels, and in particular on the diplomatic corps in Peru and Mexico. Each move was strategically calculated, like a game of chess. An official letter sent by the Silva Velarde, the then Peruvian minister for foreign trade and tourism, to Ildefonos Guajardo, the Mexican secretary for economy, was one of the first documents used by the loggers. In letter Nº 95 of February 2016, three months before the intervention of the prosecutor, the minister stated that “at that time it was not possible for either the Mexican importers, the customs authorities, the National Forestry and Wildlife Service, or the Peruvian exporters that purchased the wood (those who buy as opposed to those who produce) to be aware of the presumed illegal origin of any of these forest products...under investigation [which] come from forests in the Loreto region, where the regional government has controlled the forestry and wildlife authority since 2010”. The investigation confirms that the shipment of illegal origin was released in Mexico. Another important document was a letter sent on 21 April 2016, in which Carlos Obrador Garrido, the head of the Latin America and Caribbean branch of the foreign affairs, confirmed that representatives of the Mexico-Peru Chamber of Commerce had met on 22 March 2016 in the Mexican ministry to address “the set of problems the latter had encountered in importing Peruvian timber”. This document shows the Mexican diplomats to have agreed with the position of the businessmen that “...no irregularity whatsoever in the documentation presented by the vessel and that obtained by authorities was detected”. The ministry bases its view on the consultations undertaken with the Mexican Attorney General, the Tampico Integrated Ports Administration, the Federal Environmental Protection Prosecutor, and the Secretary for Environment and Natural Resources. Timber traffic in the Amazon is slowly corralling and devaluing their forests. It is noteworthy that no mention is made in the ministry’s response about the criminal investigation underway in Peru. It only mentions that “in order to release the goods given the request for legal assistance formulated by Peru, it is necessary to continue with the formalities until everything is completely clarified. It was final point of the ministry’s document that finally unlocked the release of the timber. This instructed the local authorities as follows: “The owners may present irrefutable evidence that demonstrates their ownership of the property and request its return so that, if accepted, the property can be returned". Each businessman provided their documentation and recovered their share of the shipment. The first part of the timber was released during September and October 2016. By December, it had all had been delivered. Guiulfo claims that the role of the Secretary of Foreign Affairs was “fundamental to the clearance process” and is thankful that “[t]he Mexican government played its part correctly, something they need to be congratulated for. It was easier for them to look the other way and avoid friction with Peru”. 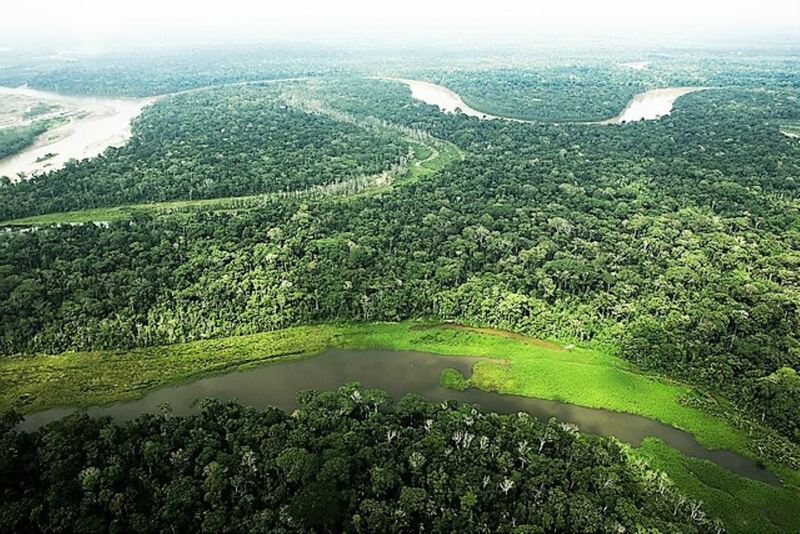 The Peruvian businessman claims to have been, in 1988, one of the first timber traders between Peru and Mexico. According to official figures, Mexico was at one time the largest importer of timber from the tropical forests of the Amazon. It has since been superseded, first by the United States and more recently by China. The route was suspended following seizure of the Yacu Kallpa. The trail of irregularities in the delivery process for this illegal shipment becomes clear in the official Peruvian and Mexican documents to which this investigation had access. Everything took place without the knowledge of the specialist prosecutor for environmental offenses in Peru. On 2 February 2017, almost two months after the timber was released, the Peruvian embassy in Mexico sent a diplomatic note to the Secretary of Foreign Affairs of Mexico. This indicated that “[t]he international legal cooperation unit of the office of national prosecutor has become aware, unofficially, of the delivery of 3,331 bundles of wood in Tampico, Tamaulipas, to the apparent owners”. 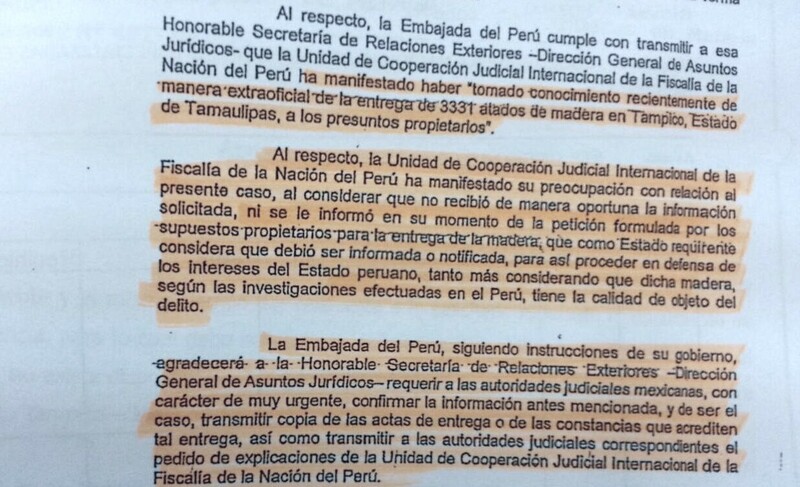 This note (Nº 5-19-M/034) reveals ignorance by Peruvian authorities about what had taken place in Mexico. The document mentions that the Peruvian international legal cooperation unit “has expressed its concern about this case and believes it neither received the information it requested, nor was informed appropriately about the request prepared by the alleged owners of the wood for its delivery, as the petitioning state believes it should have been so informed or notified so as to be able to proceed in defense of the state’s interests, more so considering that the timber, according to investigation undertaken, is part of a crime in Peru”. Whilst the businessmen who owned the timber in Mexico celebrated the release of the shipment, in Peru the environmental crimes prosecutor Julio Guzmán declares that its irregular nature has affected the struggle against illegal logging in the Amazon and undermined investigations into timber trafficking. According to this official, under no circumstances should the shipment have been cleared. “From the prosecutor’s office we will initiate legal actions against the Peruvian authorities that permitted the delivery”. He emphasizes that “only the Public Ministry could have provided the authorization, something which did not occur”. In addition to these measures, the prosecutor announced that the entity was also evaluating the presentation of a civil compensation action for the loss of an asset that belonged to the state. “The seized timber was in the hands of the Peruvian state and its release affects the patrimony of the state. Guzman explains that as part of the criminal investigation, the prosecutor will also request that the exporters of the timber in question be included as responsible third parties. Inversiones La Oroza, Sico Maderas SAC and Corporación Inforest MC SAC are companies with a long history in Peru. OSINFOR verification reports substantiate the illegal origin of the timber transported by the Yacu Kallpa. The purpose of these reports is confirm that the forest areas of extraction registered are real and authorized for logging. They showed that 96% of the shipment was illegal. "There was no evidence that the timber had left the sites of extraction claimed. Almost none of the shipment to be traded is justified according to the field studies", explains Rolando Navarro, the former head of OSINFOR, who was dismissed from his job just after the inspection he led to identify the source of that wood. This information is now part of the file of the Peruvian prosecutor who is investigating the case of illegal logging and timber trafficking. The representative of the Peruvian Judicial Branch sent this letter last year to the Mexican authorities requesting information on the fate of the timber that had a restraining order. The story of the released timber includes an active network of authorities, and export and import companies linked to the trading of forest resources in Peru and Mexico. They are all connected. The buyers of the wood are also members of the National Association of Importers and Exporters of Forest Products. The businessmen benefiting from the diplomatic strategy are among the most important in the industry. Several are located in Guadalajara, Mexico. Among them is José Ernesto Ceballos Gallardo, who is also a director of Grupo Cebra in the United States, according to the records in the state of Nevada. There he owns Global Plywood, one of a number of logging companies that were raided in 2016 and accused of importing timber declared illegal by Peru. Using the business name Grupo Forestal S.A de C.V., Ceballos Gallardo, of the Grupo Zebra, was one of the main buyers of the cargo of the Yacu Kallpa. Also among the 16 buyers are the companies Tryplays y Madera, of Gerardo Huerta Madrigal, and Sud American Lumber, of Eduardo Guiulfo. All are members of the National Association of Importers and Exporters of Forest Products of Mexico. We sought a statement from José Ceballos, but after initially accepting our request he later declined to be interviewed. Eduardo Guiulfo played an important role as a link between both countries. It was he who sent a letter to the then Mexican minister of foreign affairs Claudia Ruíz Massieu Salinas. The letter begins with a reference to the interest that the minister has in the "processes of trade integration in the strategic alliance with Peru". Around the same time, March 2016, Ruíz Massieu met in Mexico City with her Peruvian counterpart, Ana María Sánchez Vargas, within the framework of the Mexico-Peru Strategic Association Council. The Mexico Peru Chamber of Commerce lead by Guiulfo took advantage of the political situation and requested that the shipment detained in Tampico be included in the alliance agenda. The chamber made reference to “serious damage to the entire logistical chain” of the timber business between both countries. The document that the logging entrepreneurs sent states that “[i]t could be affected from the start by the problems associated with timber exported from Peru and imported by prestigious (sic) Mexican traders, causing serious financial damage to the entire logistic trading chain, in addition to deterioration of the image and the opportunities of the alliance”. The letter also accuses OSINFOR of having "provided information beyond its responsibilities" when interacting with agencies such as INTEPROL in Peru. 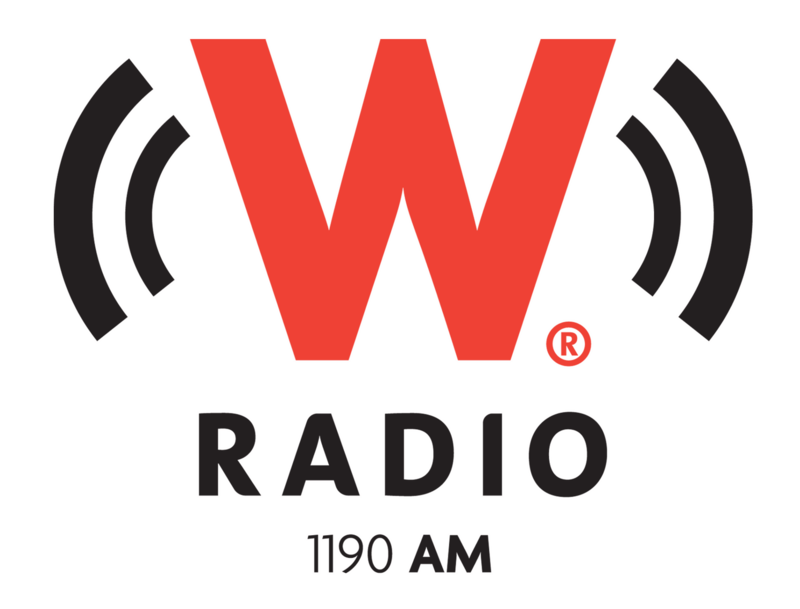 The chamber complains about the negative publicity about "stolen wood from illegal logging". In the same letter addressed to minister Claudia Ruíz Massieu, Guiulfo refers to the letter sent by the then Peruvian minister of foreign trade and tourism Magali Silva Velarde, to the Secretary of Economy of Mexico, Ildefonso Guajardo, to reaffirm that "the departure of timber products from Peru was legitimate. In Mexican ports such as Tampico, where the timber on the Yacu Kallpa arrived, checking of timber focuses primarily on preventing pests. Arturo Rodríguez Abitia, the Deputy Prosecutor for Industrial Inspection of the Federal Attorney for Environmental Protection, indicated that while the processes in the ports include the review of documents by his agency, there is no way for it to trace timber shipments in the country of origin and contrast the documentation with that available in the exporting country. The unit has just 90 inspectors responsible for verification at 67 points in ports and airports across Mexico. "We are pushed to the limit. We need greater capacity to be more effective with surveillance", acknowledged Deputy Attorney Rodriguez. In fact, shipment routes from the South American jungle demonstrate how Mexico has served as a transit point for timber destined for the port of Houston in the United States, or according to official investigations, for border crossings by road that mask the true origin of the giant logs. Raúl Benet, the public policy coordinator of the Mexican Civil Council for Sustainable Silviculture, questions whether Mexico cleared the wood shipped on the Yacu Kallpa ship. For this expert, that the Mexican authorities released the cargo is merely a "the reflection of the lax laws applying to the market for the import of forest resources in a country that focuses only on phytosanitary review and not the legal origin of the timber". These measures are clearly insufficient to properly counteract deforestation.